The Indian electoral map is now covered in a swathe of orange (my favourite colour, the irony…) and the Bharatiya Janata Party (BJP) and its leader Narendra Modi (NaMo) prepares to become the first single party majority government since 1984. Their victory was enabled by a big swing away from the ruling party, and a first past the post election system that leaves them in absolute power with less than a third of the electorate voting for them. 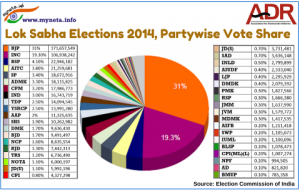 This post is not about numbers and electoral analysis, there’s plenty of of that elsewhere. As a left-wing, non-religious progressive sitting far away from India, I am dismayed at the power the BJP will have to make things difficult for minorities of all kinds, non-Hindus, the GLBTQ, and more. The BJP has made noises about “simplifying” environmental clearances, which only means more mines, more coal and more displacement, especially of poor people and tribal communities. Fundamentalist acts of violence may also increase, Kafila has already compiled a number of incidents of Hindu aggression towards mosques and Muslims. This parliament will have the lowest Muslim representation in a while, with not a single Muslim BJP representative. This NDTV article is a quick and basic summary of why Modi and the BJP won. On the negative side for the congress, the atrocious corruption, a reluctant leader (5th generation placeholder of a once “great” ruling family), a prime minister who has to sit in the upper house because he can’t win elections, a country with infrastructure gaps and poverty greatly in odds with the aspirations of its people, and general disgust with the status-quo. I would have been dissatisfied with the congress as well. On the positive side for the BJP, their party was well organized, they had a big ground advantage with the RSS and more, Modi’s long tenure as chief minister of an outwardly successful state (Gujarat’s success predates Modi by more than 10 years, but why let facts get in the way) helped, and the cult of personality around his “decisiveness” was built by the BJP and amplified by the media. India is of course a very complex electorate which requires very different messages to the different groups. But the overall message was simple, Modi rocks!, we’ll do better, Rahul Gandhi is an idiot, and the congress is corrupt. I find it hard to believe the unqualified declarations, like this one on live mint, that this is some kind of “capitalist” revolution. India has been here before. There seems to be a collective amnesia on the previous BJP-led administration that was in power between 1998-2004, made very much the same noises, albeit with a moderate face in front, Mr Vajpayee, and made a big show of development in cities, “business friendly” (code for crony capitalist) policies, nuclear chest-beating and more. All this culminated in the infamous “India shining” election of 2004, where the BJP’s triumphant march to re-election was upended thanks to the utter failure of trickle-down economics to actually better the lives of the millions without basic infrastructure and a route out of poverty. While India’s upper class celebrated victory, rural India unexpectedly returned the congress to power. The BJP would do well to remember this. They can’t ignore basic income/food support to the poor, or ignore the vast inequality, riots will break out. So, it will be a hard slog. I also don’t see any answers on how the BJP is going to transform India’s institutions to provide its people with their basic needs, because this is not about who is in power, this is about the quality of a country’s institutions (What I learned from “Why Nations Fail”). I have not lived in India for more than 15 years, so I have missed most of this, and when I visit, I live in a state that is generally doing well, one where regional parties dominate, and where the BJP won one out of 39 seats. I also avoid the shouty political media when I’m there. I was born into an elite-caste middle class community with much privilege. Indian politics left me cold and disgusted when I lived there, so anything I say needs to be clearly filtered as coming from one who was an outsider then, and even more so now. While I am disturbed, I am not sure what many other progressives dismayed by the results would have wanted instead. Yes, the conservative BJP will treat its minorities atrociously, people may die, and their so called market reforms are likely to only exacerbate India’s already unacceptable inequality. But I don’t see what alternative the voters had. The ruling party was corrupt, disorganized and bereft of vision and inspiration, the various left of centre parties fragmented, inexperienced, and generally shut out. A change was coming, and the BJP was the only party positioned to take advantage of that change. 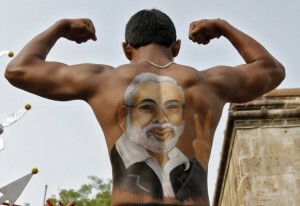 I can’t bring myself condemn the Indian electorate for going with a message of change and good governance (true or not). The gap is in the inability of progressive Indian polity to build an alternative. While the Aam Aadmi Party and Kejriwal has made progressive and populist noises recently, and even managed to win state elections in Delhi, they are young and in Kejriwal, they have a rather unpredictable leader. They were not ready, and voters can’t be expected to trust inexperience. Going forward, there are many routes for a left of centre progressive movement to take hold in India. The AAP, and other smaller parties would do well to look to countries like Brazil where worker and peasant movements slowly built and organized their way into power, and are still doing well by making their countries’ institutions better. India deserves a good progressive political option and one that is able to provide good governance without abetting pogroms against minorities, a low bar, but one both the BJP and the congress has so far failed to meet. I don’t know if the AAP is the answer, they performed reasonably well first time out with a 2% national vote percentage (not much, but good given the party fragmentation in India), and has room to grow as long as they can attract good people and build from the grassroots. They will have plenty of time before the next election to get better organized, more experienced and be a bigger force. And who knows, maybe the congress could reinvent itself as a centre-left Gandhi family-free party of good governance, stranger things have happened. Meanwhile, I hope (with little evidence) for everyone’s sake that the BJP concentrates on good governance and building institutions, and gives its chest beating and macho Hindutva glorification a rest (yes, asking a lot). The people of India voted for change and a better life, not more violence, military aggression and fighting with Pakistan. I hope that in my naiveté, I am not being blasé about the ascendance of a very dangerous administration. But I remain a strong believer in the power of the Indian electorate to stick to basics and put authoritarians in their place, not like it did not happen before. PS: The really nice picture of Modi tattooed (temporary I hope) is from this Jacobin magazine article on Modi, his “neoliberal orthodoxy and violent Hindu nationalism. ← Hey, comment on Victoria’s Cycling Master Plan!